Dental emergencies can encompass a wide range of circumstances from a sudden, painful toothache to the loss of a tooth by accident. 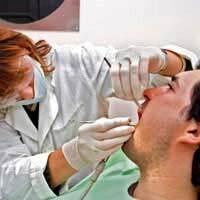 Most dental emergencies will require immediate attention from a dentist, and if left untreated can lead to further medical complications. A broken or fractured tooth can come with various levels of pain. If the tooth has fractured but hasn’t gone as deep as the inner layer, or dentin, then there may not be any pain, in which case a delay of a day or two before a dental visit should not pose a problem. However, if the crack in the tooth is deep enough to reach the dentin or the deeper, pulp layer, the pain will steadily increase and an emergency dental visit will be required. Unprotected pulp can quickly decay and die, the result could be serious infections or abscesses, and painful treatments such as root canal may be needed. If a tooth is knocked out due to an accident or blow then it does not automatically mean the permanent loss of that tooth. If you still have the tooth then place it in salt water or a glass of milk, or you can keep it in the cheek of your mouth, the tooth may then be able to be reimplanted. You have a better chance of a successful reimplantation if you can get to the dentist within 30 minutes; however, if more time has elapsed a reimplantation may still be successful. Teeth that are reimplanted with an hour have a good chance of surviving and reattaching to the socket. The quicker you can get to your dentist with the tooth the better. Toothaches have the ability to strike anywhere at anytime, and the levels of pain involved can range from dull and throbbing to the excruciatingly painful. A toothache is generally defined as any type of pain felt around the gums and teeth, and usually means that decay has entered the pulp chamber. Many people will simply battle on and leave a toothache for days or even weeks, taking painkillers to numb the pain. This type of self medication is unwise; a toothache is a symptom that something is seriously wrong with your tooth and infections have been know to spread, within days, to the jaws and neck. Very serious cases of infection that start of as a simple toothache have been known to spread to the windpipe area where swelling has caused the windpipe to close shut; the ultimate consequence of this type of infection could be death. Home remedies or over the counter medicines are not a cure for dental emergencies but they should be able to relieve the pain a little before you see your dentist. Toothache home remedies have been passed down through generations but the most common pain reliever seems to be clove oil applied to the painful tooth. Clove oil has properties that kill bacteria and also has a numbing effect on the area that it is placed on. Cool peppermint tea also has numbing agents, and ice is can also be placed on the painful area to numb the pain. Safe oral medicines from a chemist will include aspirin and paracetamol. If there is swelling in the infected area, try ibuprofen for its inflammatory agents, there are also oral gels that can be bought which will relieve pain. These remedies should only be taken as a very temporary solution for pain until a dentist can be seen. Dental emergencies should be treated with the same respect as any other medical emergency. Do not consider a toothache as something that will just disappear over time, if there is dental pain, it is a symptom of a deeper, underlying problem, and dental treatment will be needed. Your teeth are an important part of your body and should be treated with as much care and respect as any other part of the body.